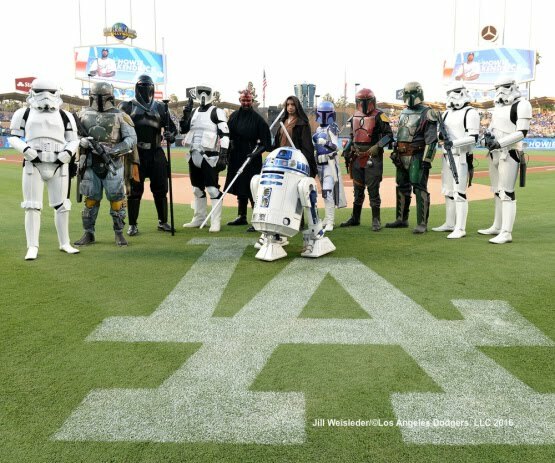 It was Star Wars Night at Dodger Stadium on Friday, and since I decided to step away from the keyboard this weekend (not that I post an awful lot anyway) I had failed to make note of it. To make up for that above is a group photo of some cosplay enthusiast in attendance, pic taken by Jill Weisleder/LA Dodgers 2016. Go here to check out a bunch of pics from the day that includes plenty of Star Wars characters taken by Jill and Jon SooHoo. This Day in Dodger History: In 1906 Brooklyn's Harry McIntire loses a no-hitter in the eleventh inning. In 1924 Dodgers pitcher Dazzy Vance establish a major league record when he struck out seven consecutive batters to defeat the Cubs. In 1957 Gil Hodges set a new NL record for career grand slams at 13. BTW, this is the last grand slam in the history of the Brooklyn Dodgers. Via Matt Monagan at Cut4; "A Dodgers ballgirl made a fantastic catch on a 108.7 mph liner, protected fan in process." Yeah. That was crazy. Via Liz Roscher at Yahoo Sports; "Yasmani Grandal catches wildest pitch ever in his chest protector." Via Ron Cervenka at Think Blue LA; "Grandal’s unusual play at the plate has happened before." Via Ken Gurnick at MLB.com; "Norris exits in first with right lat soreness: Injury puts Dodgers righty's next start in doubt." Via Matthew Moreno at Dodger Blue; "Clayton Kershaw, Justin Turner Provide For Those In Need At The Dream Center’s Back To School Bash." Kershaw and Turner teamed up at the batting cages, with the former feeding balls into a pitching machine while the latter provided batting tips. “On top of the backpacks, I think the kids, excited as they are to get it, they also want to go inside and play some games and pet some animals. It’s a great event,” Turner said. Via Doug Padilla at ESPN; "Dodgers' Clayton Kershaw still not throwing, no return date set." "He's just doing core work, the back, strengthening," manager Dave Roberts said. "He hasn't picked up a baseball yet. Hopefully sooner than later, but no baseball activities." Via Eric Avakian at Dodger Blue; "Kenley Jansen’s Recent Struggles Tied To Mechanical Issues." The ballhawk you either love or hate, Zack Hample, visited Dodger Stadium a couple weeks ago, and shares his afternoon here. He includes a whole bunch of pics. Welcome to the Blue, Josh Fields! Welcome to the Blue, Jesse Chavez! Welcome to the Blue, Rich Hill! Welcome to the Blue, Josh Reddick!